You must be here from Bea Valint's blog. 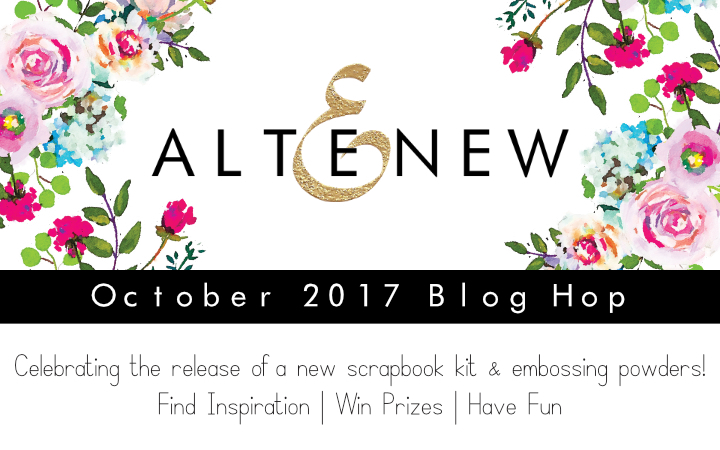 As you already know Altenew is releasing six new colours of embossing powders, embossing ink and a Scrapbook kit! I will be focusing on the Rose Gold and Platinum Crisp Embossing powders today and sharing super quick, simple cards. This card features the beautiful Rose Gold Crisp Embossing powder. I kept both cards same and simple so that the focus is more on the two shades of embossing powders. 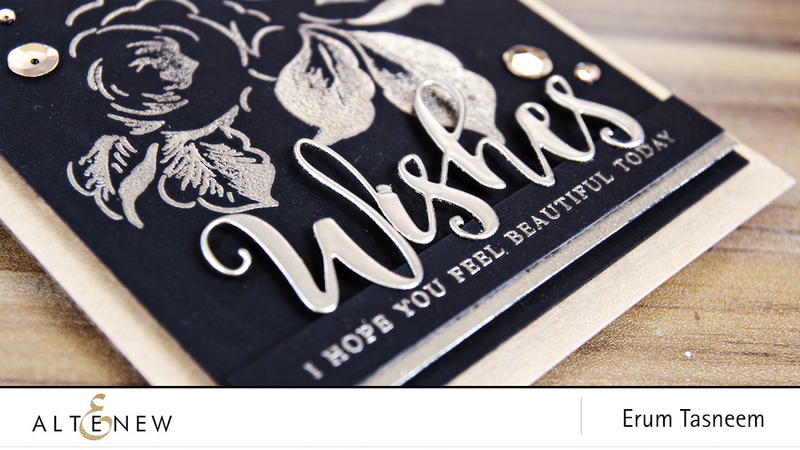 I die cut the word "wishes" and heat embossed it too along with a thin border beneath the sentiment strip. This Platinum is another gorgeous shade! LOVE it! I will be picking up a winner to receive a $30 gift certificate. I will announce the winner on November 2nd. Now the next stop on the hop is Ashley Horton. Below is the complete hop list in case you get lost. I truly adore your card design! I have not thought of just emossing one layer of my Altenew floral sets... it's so striking on the black card stock... beautiful!!! I love embossing and your cards a so crips and elegant! WOW! As always E.T. Stunning design, you truly never cease to amaze me! !LOVE this collection, it is a must have! Thanks for the inspiration! Have a wonderful day! 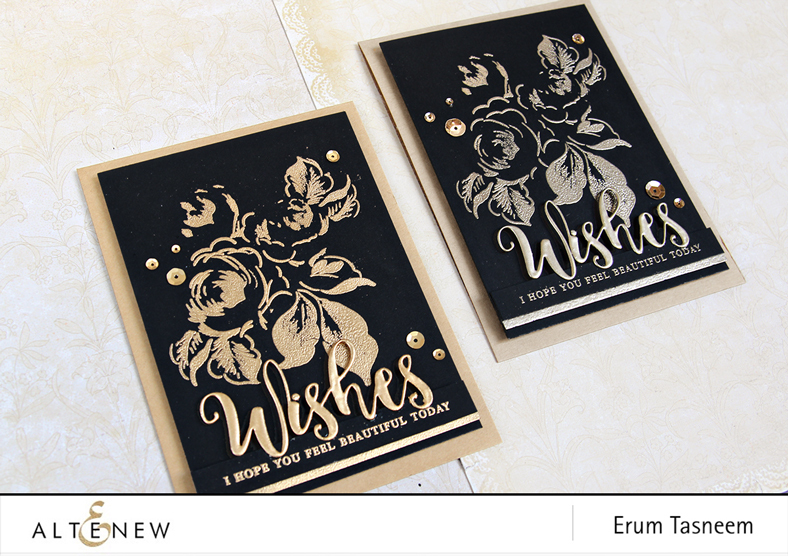 LOVE the simplicity and the elegance of these two cards, Erum. The new embossing powders are so pretty; must try to get a few of them. Spectacular cards. Amazing use of the embossing powders. Gorgeous!! Using the black card stock was perfect to showcase these new embossing powders, they really popped beautifully. Love the simplicity of your cards! It’s great also to see a side to side comparison of the two colors! Gorgeous cards! I love the embossed florals and greeting on the black - it's so pretty! I could not choose a favorite between those two, they are both so beautiful! Love the metallic on the black cardstock. Your cards are gorgeous. 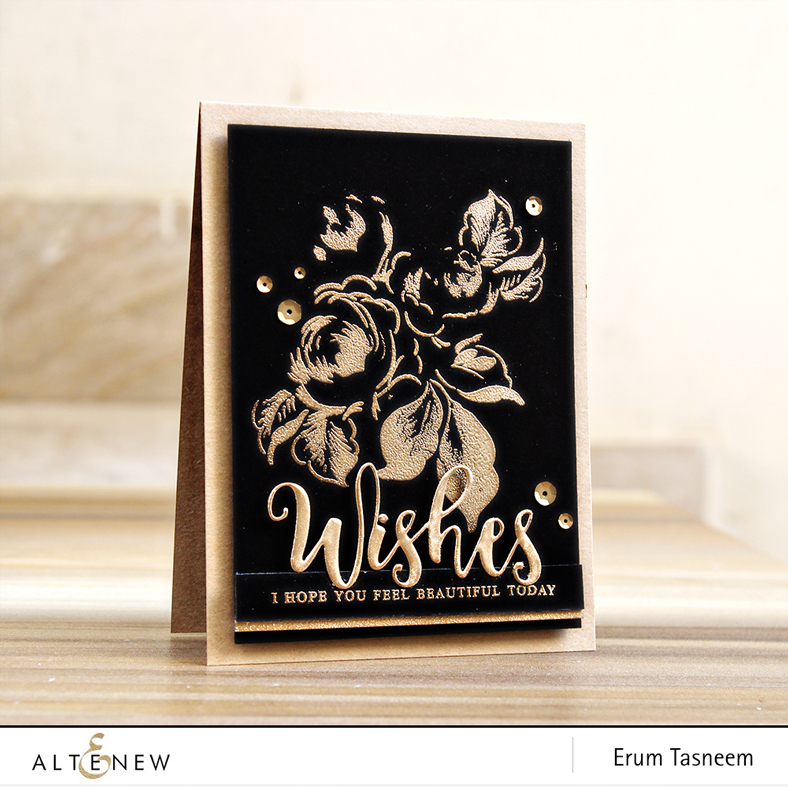 The gold and rose embossing against the black background is stunning! Fabulous card with all the embossing. Am excited to try the new colors!! What stunning and elegant cards you created! Love the simplicity of them with all the shine! Great to see these 2 powders side by side on the same design. Both are beautiful! Simply stunning and elegant cards! Thanks for sharing! Beautifully elegant cards! Thank you for showing the difference between the rose gold and platinum powders. I didn't think I'd like the rose gold, but I kind of love it! you've shown me this is a must have! Stunning cards! I can't wait to get these embossing powders, they look amazing! WOW! These cards are amazing! So beautiful and elegant! SO STUNNING!!!! And what an amazing way to show off the embossing powders😊. I am SO HAPPY to see Rose Gold....it is my obsession lately, and all of the other colors are gorgeous too. Your cards are perfection, I really do need some dark cardstock now. Thank You!!! Striking cards. Thank you for sharing. I love this card. It’s so elegant. These are simple, elegant and oh, so beautiful! Wow! Beautiful elegant design!! Thanks for the inspiration! So striking and elegant! These are stunning! So elegant with the embossing. Such elegant cards. Love the new embossing powders. Both the Rose Gold and Platinum are beautiful. Wow! Erum you've done it again! These are absolutely stunning cards with amazing embossing powders. Love the fact that we can now shop for everything we need for cardmaking and scrapbooking in one place. Way to go Altenew! Beautiful cards and amazing embossing powders. OH ERUM! These cards are simply stunning! Anything embossed on black is beautiful but these flowers are something else. Simply stunning! So beautiful.... I just adore these new colors of embossing powders. I have them all on my shopping list. Nicely done! what beautiful cards! I would never have thought of embossing those lovely Altenew flowers, but am so happy to see your creative idea. Love the embossing powders! Your cards are just beautiful! Love these new embossing powders. So rich . And vibrant. Thank you for the inspiration. So striking and elegant, love it!!! These are very elegant! Beautiful work! Beautiful card, love the embossing on black, classy cards! Erum, these cards are gorgeous! I really love the rose gold. The embossing powders look so pretty! I really like the platinum color. Great cards! Love both of these embossing powders. What beautifully elegant cards. You don't need anything else with the gorgeous curves of the stamp and the shine of the embossing powder - lovely. I love these embossed flowers on black...so stunning! Love these classy cards! The design is awesome & those powders are gorgeous? Love the embossing on these cards! Beautiful cards. They are so simple and elegant. I don't know which new color of embossing powder I like the best. I guess I need them all. Beautiful cards! Love your work! Ahhh love these embossed cards! I have the rose gold so now I better try out the platinum!! Wow! The dmossing looks so smooth, almost as smooth as foiling! I can't wait to try out all of the new powders. I love rose gold!!! Beautiful cards, tfs! 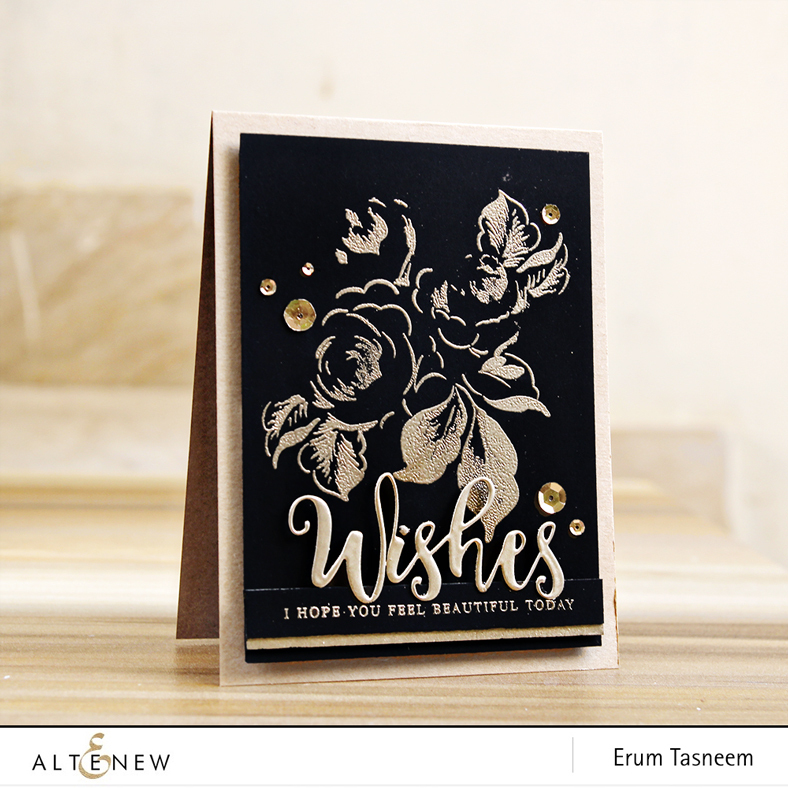 You have a lovely talent for creating simple and elegant card designs. I love those embossing powders on the dark cardstock. Thank you. Your cards showcase the high quality of these embossing powders. Thanks for the inspiration. Elegant, That is the first word that I thought of when I saw your stunning cards. Wow that embossing powder just looks amazing on your card especially against the black, TFS. Breathtaking and stunning! I love the Rose Gold embossing powder and can’ Wait to receive my order! TFS! Gorgeous cards. These would make awesome anniversary cards and or wedding cards. TFS. These embossing powders are gorgeous! Beautiful elegant cards. Not sure which embossing powder is prettier but I think I favor the Rose Gold. Thanks for sharing. Hi Erum. Not sure if I missed the information on your post. Which stamp did you use? I will just have to get it and both the embossing powders. Such stunning cards! I love both those shades of embossing powder on the dark backgrounds. Stunning cards. I love how dark cardstocks make embossing pop. Thank you for sharing. two such lovely cards in the new embossing colors = wonderful!! Gorgeous! thanks so much for sharing your creations! the embossing powders are stunning! That Rose Gold embossing powder on black is gorgeous! 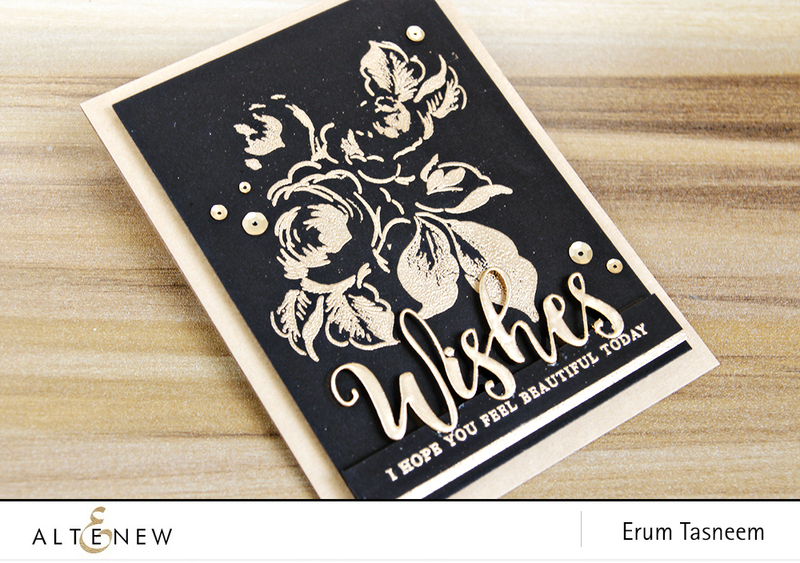 LOVE the simplicity of your cards Erum! Elegant cards! Love the embossing powders! I like how the simplicity of the card creates drama through the bold contrast of the gold on black. Lovely! Gorgeous cards, love these simple and oh so elegant cards with my two new favorite embossing powders. Perfect sentiments for these beauties too. Oh my goodness !! These cards are so beautiful and classy ! Your cards are stunning! Altenew’s new embossing powders are going to bring a whole new level and design possibilities for their amazing stamps! So excited to try them! So simple but elegant card. Great to do a bunch of them. Stunning card with that rose gold embossing powder - can't wait to try the new powders out! Just beautiful, as always! The rose gold embossing powder looks amazing. Such a stunning card!! Stunning cards, elegant and simple. I love the embossing powders. Love the embossing on the black. The gold and silver shine. Wow! These are gorgeous! I love the pop on the black! Such an elegant card - love the embossing. Beautiful design! Love rose gold embossing powder, such a warm color! Those are 2 stunning cards!! just stunning ! the platinum is pretty but that rose gold is to die for. Wow, I love the metallic embossing on black card stock for a dramatic look! Love the metallic embossing powders on the black cards, especially the rose gold. Very lovely cards! Your cards are so rich and elegant. Well done. Those embossing colors are my favorites. I love the simplicity of your cards. Hard to choose between the platinum and rose gold versions as both are gorgeous. Wow, your cards are Amazing! Love the metallic embossing powder on the dark background. Thank you for the inspiration! So pretty...these embossing powders are gorgeous. Wow, stunning cards!! 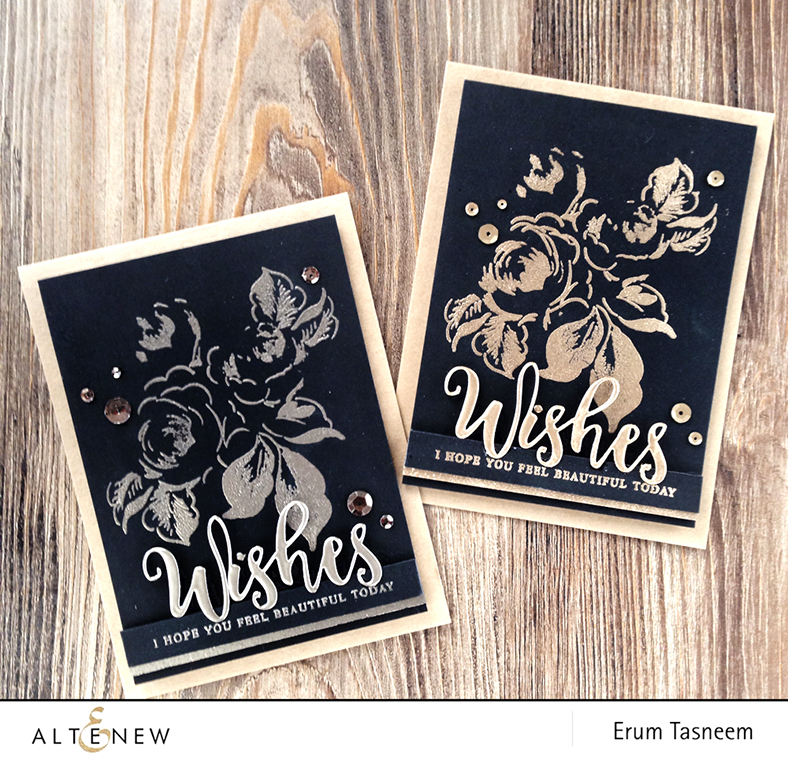 The black cardstock with metallic embossing powders are so elegant and classy. Love it!! Beautiful cards! I love how elegant they look with those new colors of embossing powders. Gorgeous cards!! They are so rich and elegant looking. The new embossing powders are awesome... especially love the rose gold. Wow these cards are super elegant and beautiful!! Love your gorgeous embossed cards. Striking cards, I love the beautiful embossing against the black background. Thanks for sharing. I love these cards.. These are some great embossing colors too!